For air quality forecasts for the next 72 hours, click here. 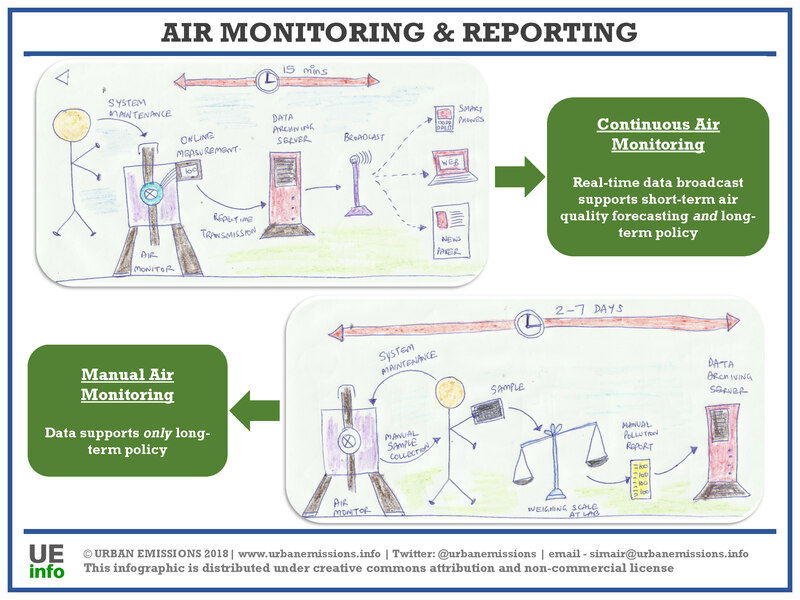 A combination of satellites provide a cache of measurements, which are interpreted using the global chemical transport models to better represent the vertical mix of pollution and finally arrive at the ground-based estimates with the help of past ground-based measurements. The global dataset is available at 0.1° and 0.01° resolution, in multiple formats to import and use on multiple presentation platforms. 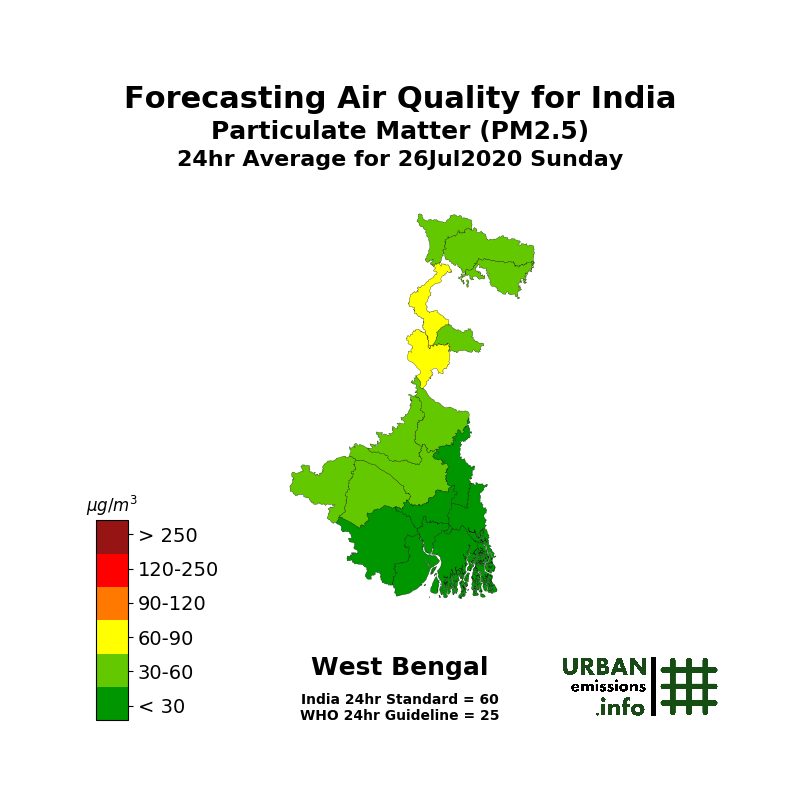 We utilized the finer resolution data to build India specific maps (modeling domain of India’s air quality forecasting program) aggregated to state and district levels. Browse here by state and by district to see evolution of PM2.5 concentrations between 1998 and 2016. Gridded annual maps of PM2.5 concentrations by year between 1998 to 2016 are available here. Gridded annual maps of % change in PM2.5 concentrations since 2000 are available here. 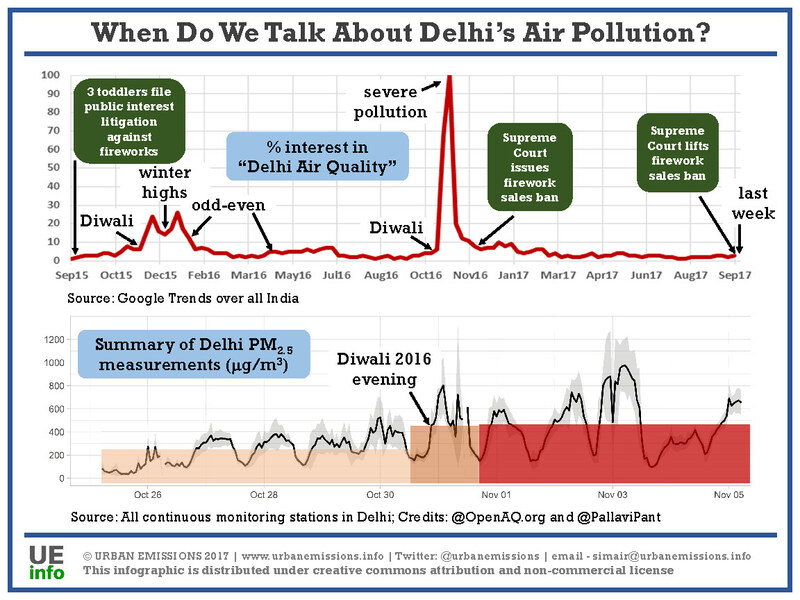 September, 2017: The continuous air monitoring data is presented here as an online resource, with data feeds from the publicly accessible stations with reference grade monitoring equipment, mostly operated and maintained by the Central Pollution Control Board (CPCB) and the State Pollution Control Boards. All the data from these stations is available from CPCB website. A secondary source to download archived data is @ http://www.openaq.org (this is a portal with open access to monitoring data from stations across the globe; and also allows you to download data for select station or city or time period; compare data between stations, between cities, visualize the trends spatially and temporally, and much more). 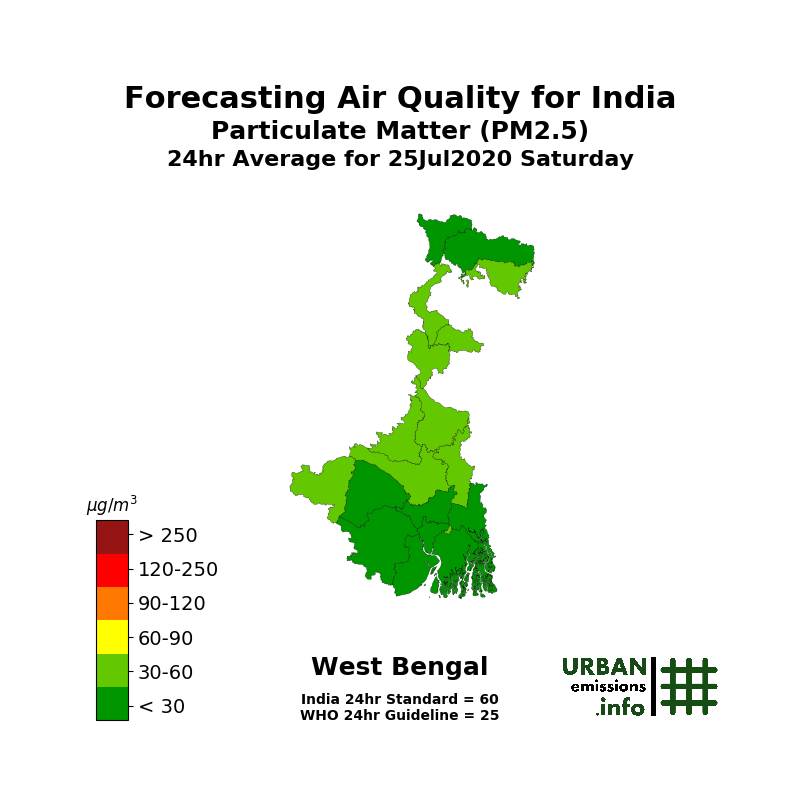 We also present an assessment of what India needs to spatially, temporally, and statistically represent the ambient pollution in the urban and the rural areas – based on thumb rule proposed by CPCB and the district level urban and rural population (as per 2011 census), we estimate a need for 4,000 continuous monitoring stations (2,800 in the urban areas and 1,200 in the rural areas). Browse the requirements by state and by district here. Open fires associated with agricultural residue clearing (after the seasonal harvests and a typical process to prepare for the next crop) and forest fires (associated with hot and dry conditions and some times intentional) is an important source of particulate and trace gas emissions. Detection of these fires is a complex methodology, made easy with the availability of a series of open satellite feeds. We utilize the NASA Worldview platform to visualize and access this information. 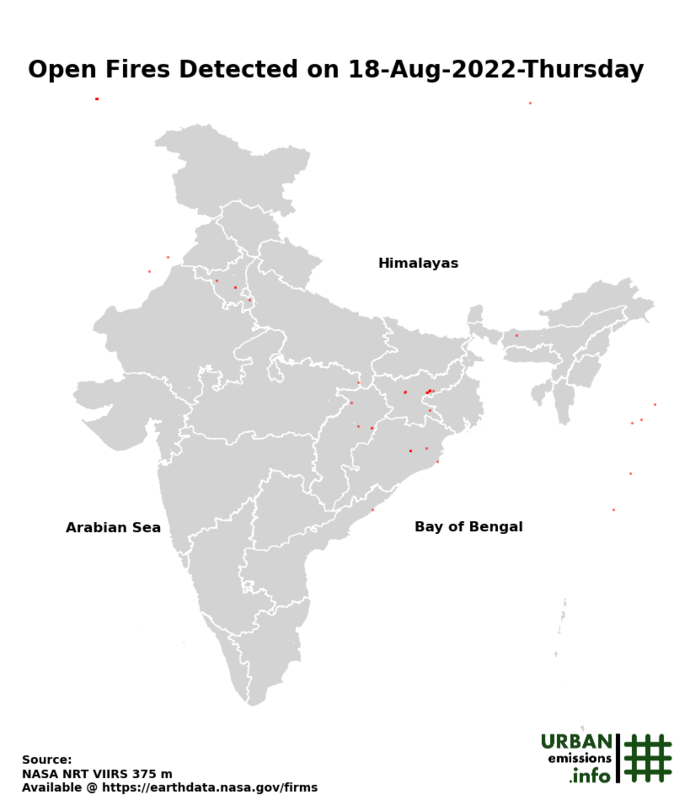 Image to the right presents all open fires detected over the Indian Subcontinent in the last 24 hours (updated with VIIRS feed every 3 hours). A multi-pollutant emissions inventory, estimated using the location information and land-use databases (agricultural, forest, urban, water, arid, etc.) is available from UCAR-FINN program. For more details and to access archives, click here.